Why do Americans learn a foreign language? For college-bound high school students, it can be something like taking calculus or organic chemistry – it looks good on a transcript. For a previous generation, perhaps, it was a mark of refinement. And then there’s Ken Dutch. He’s not a high school student, and he wasn’t worried about his pedigree. “I felt really dumb not being able to say anything to the people that I was hauling rocks with,” he explained. So the mathematician who has spent portions of the last seven years volunteering in Haiti enrolled in Haitian Creole at Indiana University’s Summer Language Workshop, where it is being offered for the first time in 2017. One of five students taking the language this summer, Dutch has had to leave before this summer’s course is over to return to the island nation for a teacher’s symposium. 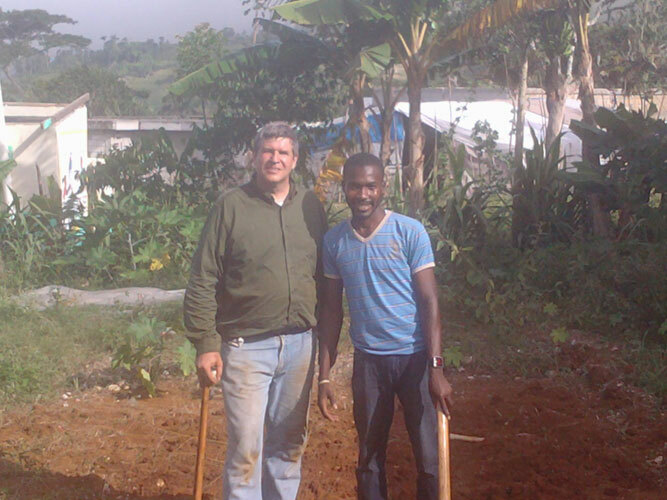 It’s one of the projects – along with hauling rocks to build houses – he’s gotten involved with. On this trip, he’s also selling home-made Scrabble boards to boost literacy while raising funds for a seed bank. A native of Omaha, Nebraska, Dutch grew up in a tight-knit yet insular community in which people pitched in to help one another during adversity. He was raised on the story of his grandfather recruiting his teenaged sons to heave sandbags for three days against the rising Missouri. “If there was stuff that needed to be done it should probably be you,” he explained. Dutch’s first lesson was that most people don’t speak French in Haiti. French is taught in high school, used in church, and is still the “door-opening language for positions in government,” but only a third of the population speaks it. The language everyone speaks is Creole. Convinced that he had come to fix things, Dutch wanted to get to work. Sometimes he would work so much he neglected to do his laundry – a faux pas in a society that, as Dutch describes it, takes its grooming seriously. But in time, he realized he was neglecting something far more critical. “I came to be known as 'the white guy with the dirty pants.' But then it was worse than that – they also called me 'the white guy who won’t talk to anybody. '” After being thronged for the first few days after arrival by curious residents hoping to learn about his life back home, the self-described introvert took to waking up at 5 a.m. to make his way to the job site without chit-chat. 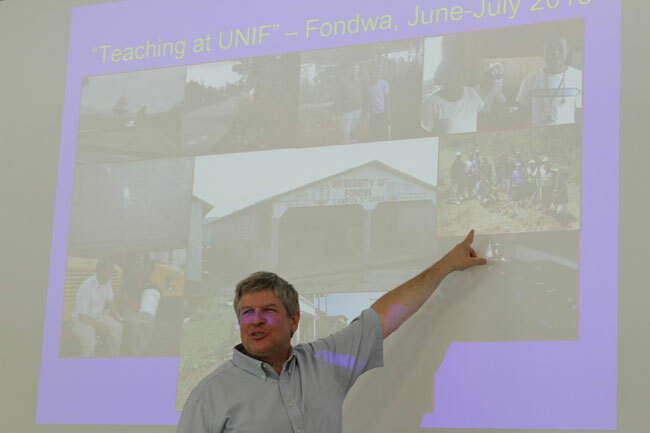 Ken Dutch shared his experiences during a Brown Bag Lecture at the Summer Language Workshop June 29. The workshop, administered through Indiana University’s School of Global and International Studies, continues through July 28 with a series of films, lectures, and events open to the public.